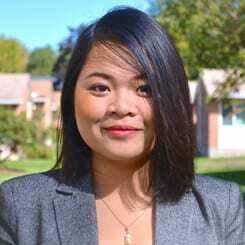 Trang Tran graduated from OSU with a Master of Public Policy in 2015. She is currently a researcher at the Institute of Social and Economic Research, University of Alaska Anchorage. While at OSU, Trang worked closely with Hilary on an Oregon Sea Grant-funded project examining public participation and community mobilization surrounding the siting of liquefied natural gas facilities in Astoria and Coos Bay, Oregon. She also coordinated community-based research projects at OSU’s Policy Analysis Laboratory. In her spare time, Trang loves traveling, hiking, reading and spending time in her kitchen. She completed her bachelor’s degree in International Studies at the University of Da Nang, Vietnam.